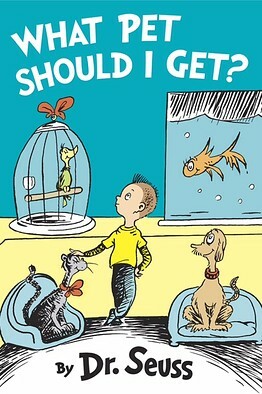 Legendary author Dr. Seuss has an all-new book called What Pet Should I Get?, hitting shelves July 28. Although Seuss died in 1991 at the age of 87, the manuscript for What Pet Should I Get? was only recently discovered, and features the same characters from the classic One Fish Two Fish Red Fish Blue Fish (1960). Sure, it may be a bit too “young” for you, but it could be a fun trip down memory lane. After all, I’ll bet that most of you started off reading Dr. Seuss books. I know I did. Theodor Seuss Geisel (March 2, 1904 – September 24, 1991) was one of the most iconic writers and illustrators of all time. He published 46 bestselling books, including Green Eggs and Ham, The Cat in the Hat, The Lorax, Fox in Socks, Horton Hears a Who! and How the Grinch Stole Christmas! This entry was posted in News & Reviews and tagged homepage, Slider on February 18, 2015 by Clay Swartz. Dr. Seuss is an amazing writer I can’t wait to read the new book. If anybody tells you your too old for Dr. Seuss, laugh at them. They probably never read a book like Dr. Seuss. I don’t know about the people at Boys Life, but I’m never too old for Theodor Seuss Geisel.